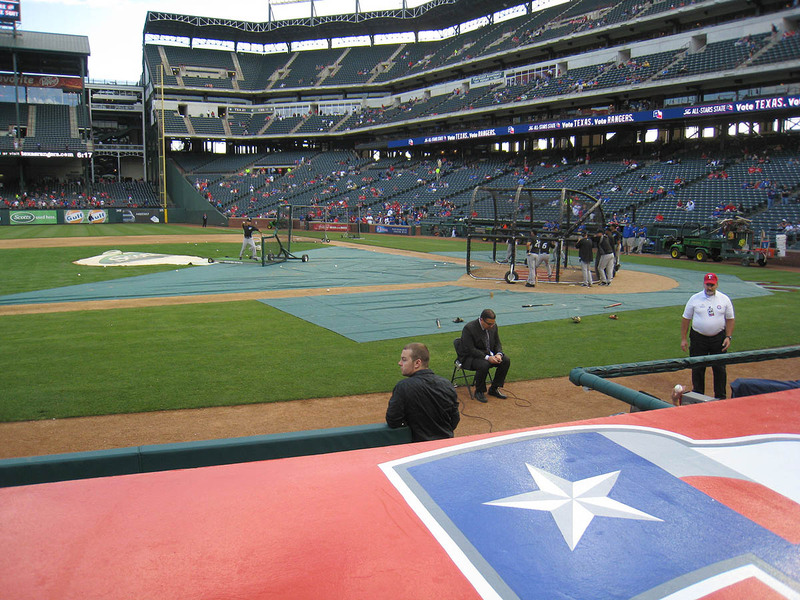 Rangers Ballpark was opening for batting practice. A security guard asked me to open my backpack, and when I did, the zipper broke. As you can see, I scraped the knuckle on my right thumb — not a big deal, although it did sting for a little while. 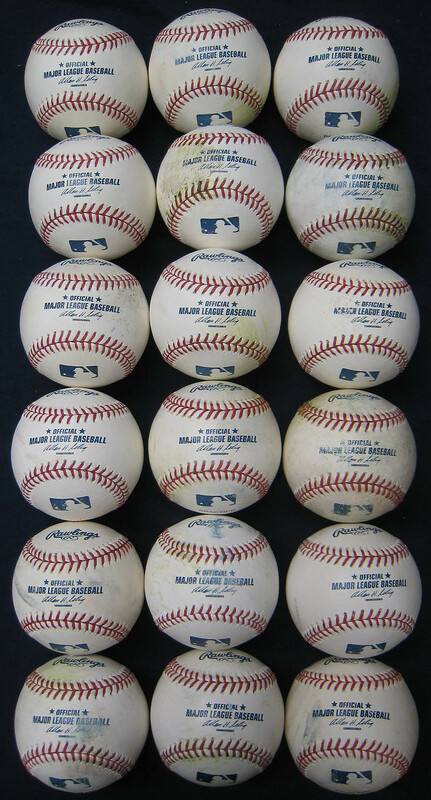 Anyway, my first 10 balls were all hit into the seats; the first five were home runs, the sixth was a liner into the stands along the left field foul line, and the following four were homers. Ian Kinsler hit a few. 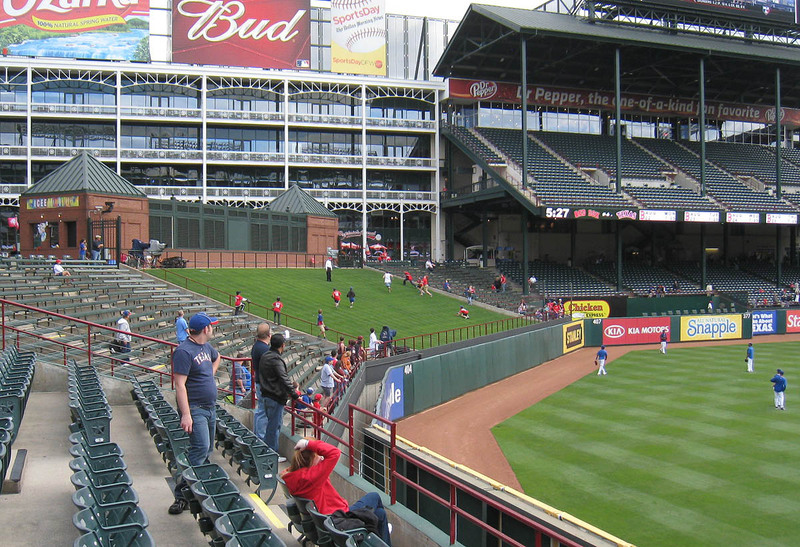 Adrian Beltre hit a few — or was it Nelson Cruz? I was so busy snagging that I didn’t have time to take notes or photos. I do, however, remember one of my catches, but can’t recall which ball it was. Kinsler blasted a deep drive that I quickly determined was going land several rows behind me, so I turned my back to the field and raced up the steps and and darted to my right. When I turned back around and looked up for the ball, it was right there. I mean RIGHT there. 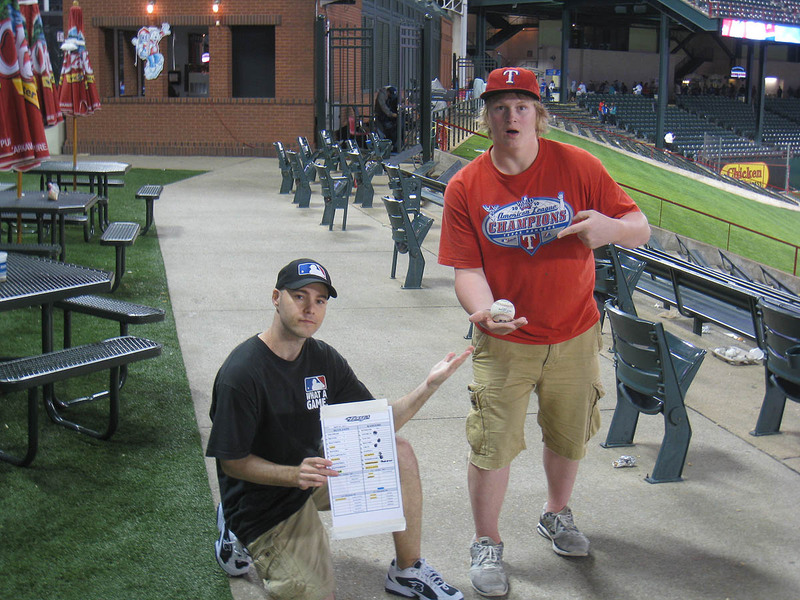 It felt great to have picked the exact spot where the ball was going to land, but I ended up misjudging another homer at the end of BP, so, you know, I’m not perfect. 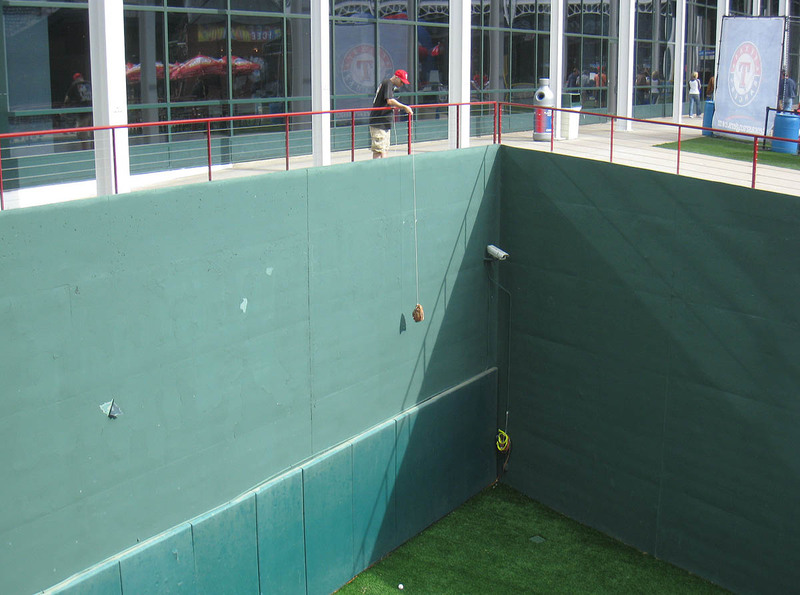 …and snagged several balls apiece. 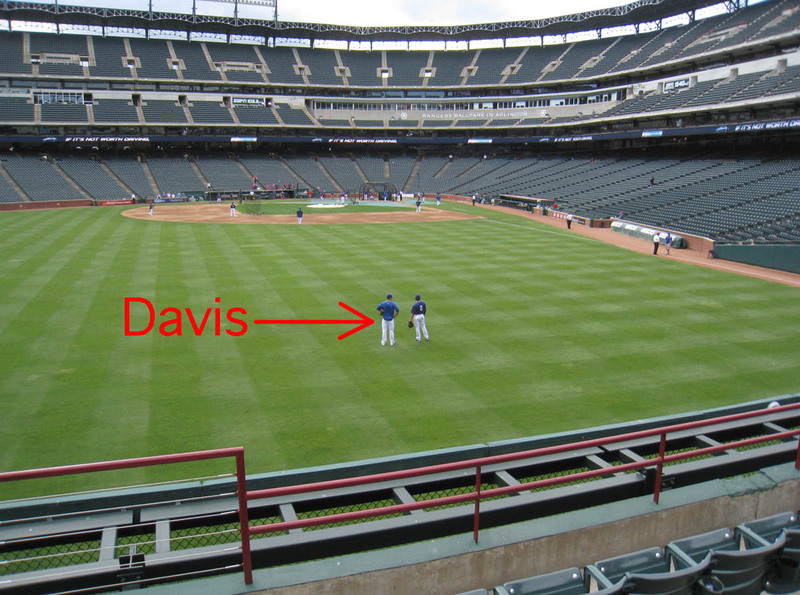 At one point, when he jogged toward me to retrieve a ball near the warning track, I asked him if he wanted to play catch. 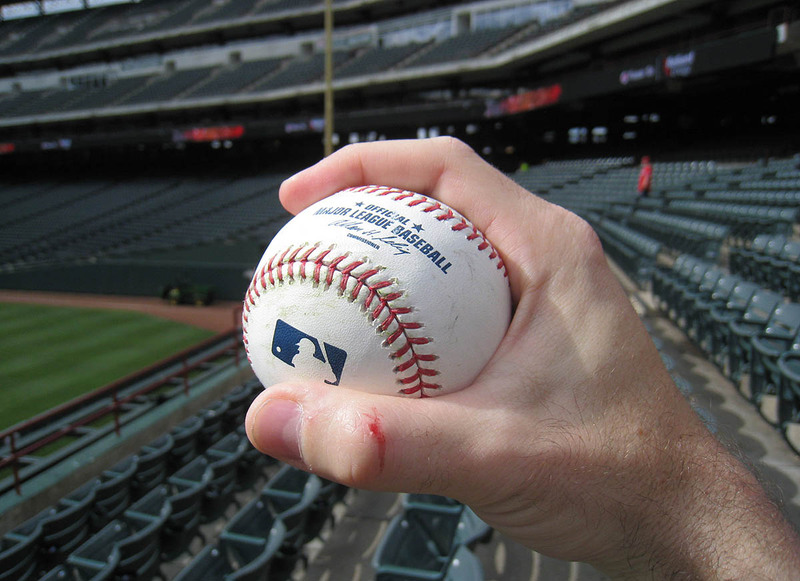 He responded by tossing it to me, and when he held up his glove, I threw a decent knuckleball back to him. He smiled and gave me a friendly nod and fired an equally decent knuckleball back my way. We kept throwing knucklers, taking brief breaks whenever the batter was about to swing, and after a minute he let me keep the ball. My 12th ball of the day was a home run that landed in the seats. 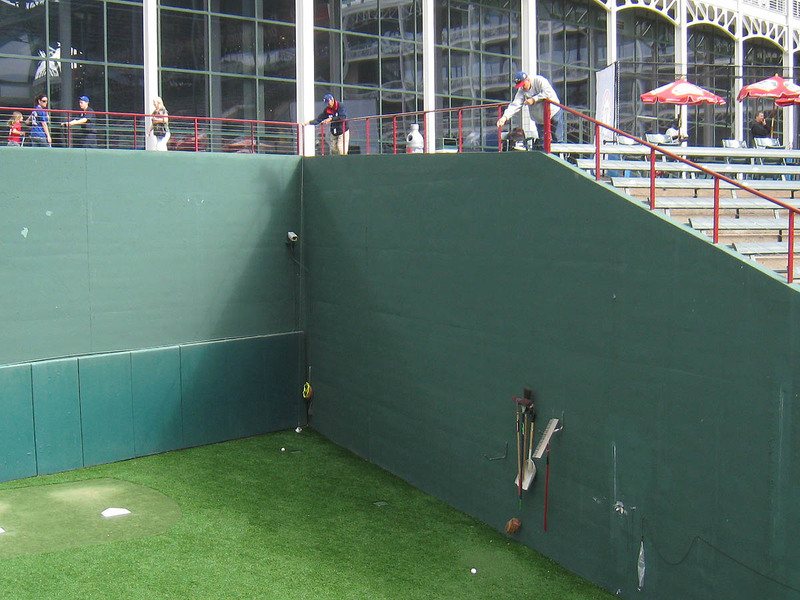 My 13th was a homer that landed in the gap behind the left-center field wall; I used my glove trick to reel it in. 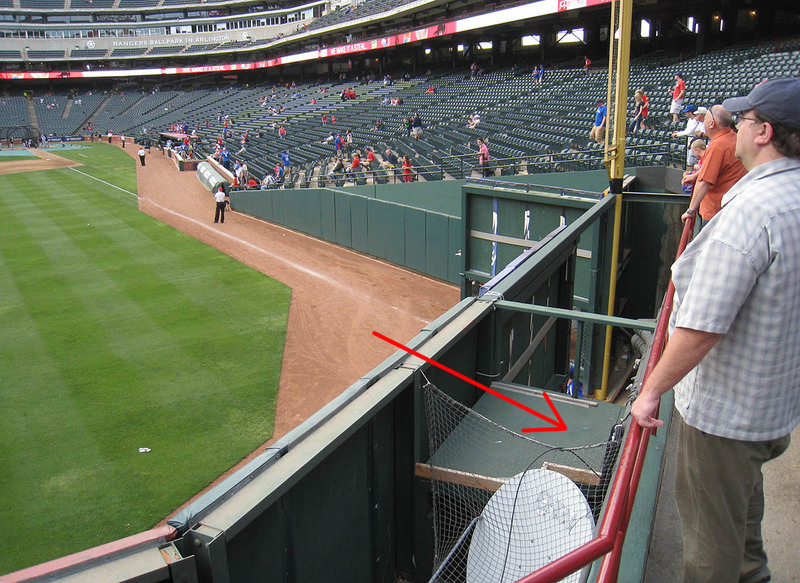 As I’ve mentioned before, the security guards at Rangers Ballpark don’t stop people from using devices. The whole stadium is fan-friendly in every conceivable way. As my glove reached the ground, an employee in the bullpen walked over and picked up the ball. Then he grabbed my glove and peeked inside to see how it was set up. Then he tossed me the ball, my 15th of the day. 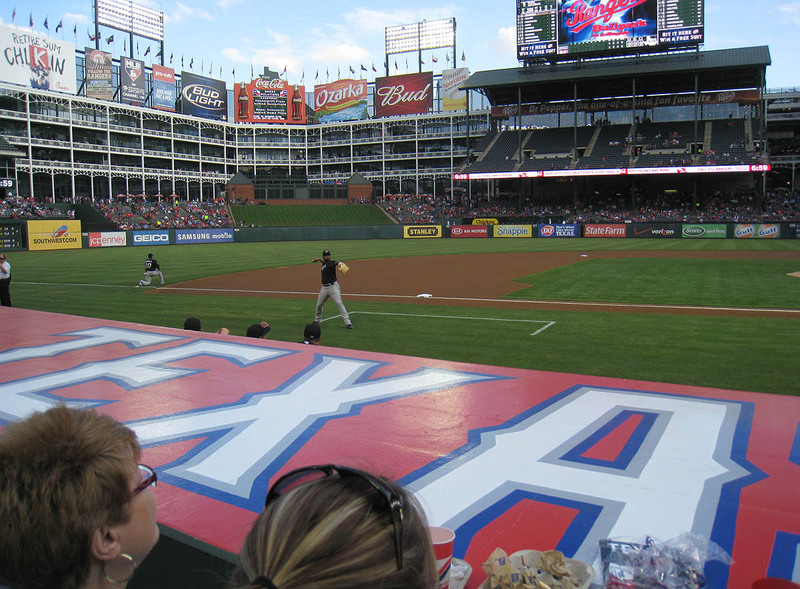 I returned to the left field seats with it and picked out the smallest kid in the section. I walked over to him (and his family) and asked to see his glove. He must’ve thought I was going to do something bad because he hid it behind his back and hugged his mother. I responded by holding out the ball for him. He didn’t understand what was happening, so his father encouraged him to show me his glove. “Go like this,” I said, making a gesture with my own glove so that it was open with the palm facing up. When the kid imitated me, I placed the ball in his glove, and his entire family cheered. What an awesome stadium. Wow, wow, and more wow. 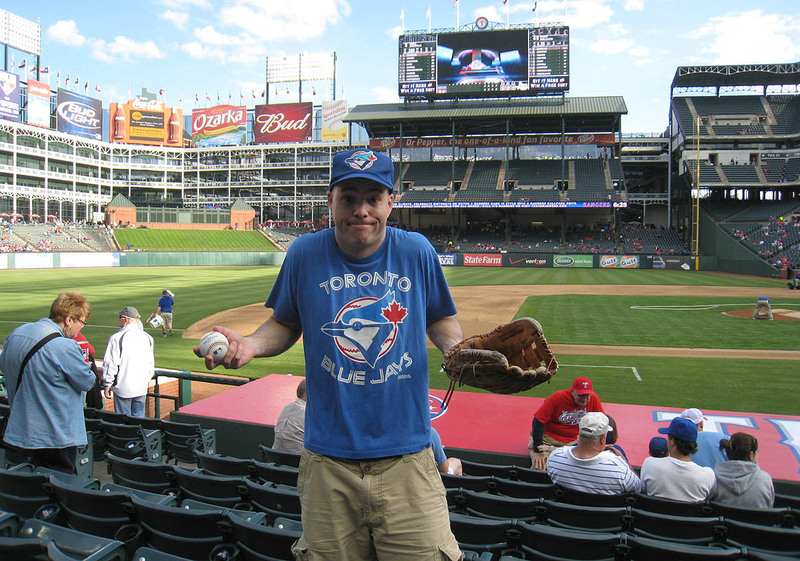 When the Rangers cleared the field, I changed into my Blue Jays gear, and it paid off immediately. Travis Snider wandered over in my direction to retrieve a ball on the warning track. “No chance at all,” he said without looking up. “What would it possibly take to get one from you?” I asked. That made him look up for a split-second. I used my glove trick to snag it and handed the ball to the nearest kid. My backpack, meanwhile, was getting heavier by the minute. I had to hold it carefully to prevent all my stuff from spilling out. It was a constant source of stress. 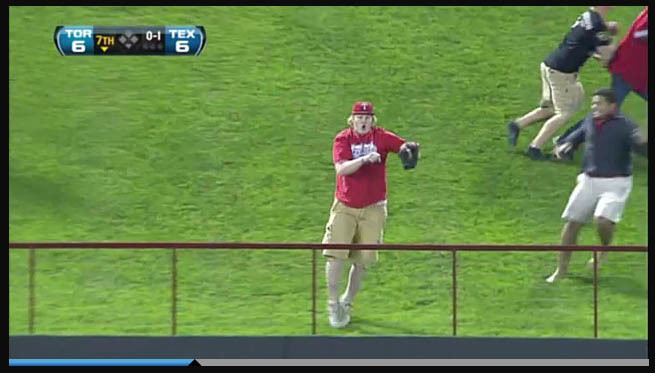 Soon after I snagged the ball off that platform, I caught a home run on the fly. 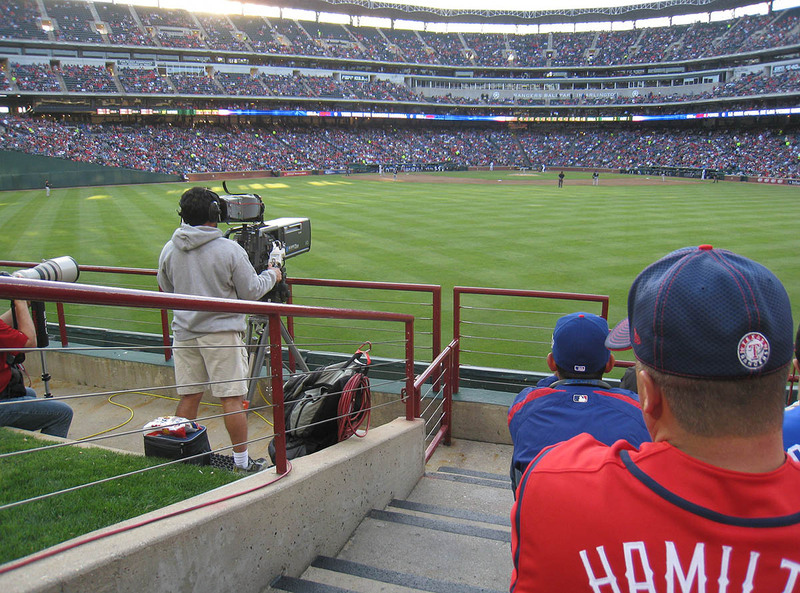 It wasn’t easy because the left field seats were filling up, and the sun was in my eyes. That was my 19th ball of the day, and I got No. 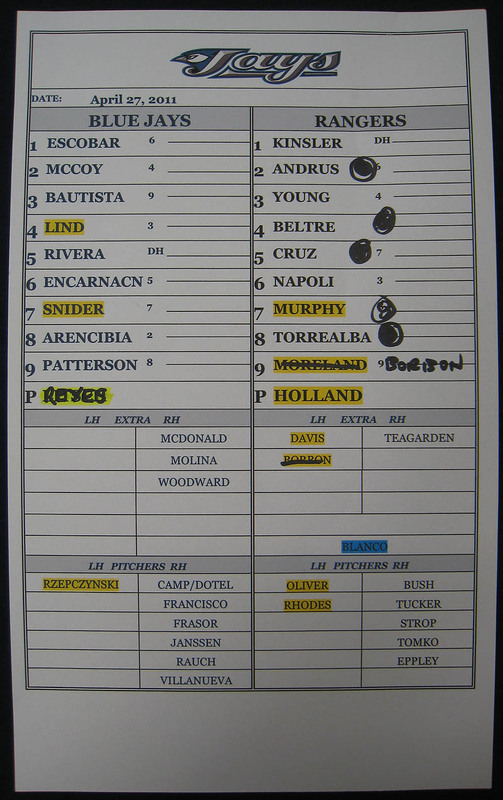 20 from Jays first base coach Torey Lovullo (who was wandering in left field with a fungo bat). All I could do was shrug. For the record, Frank is 6-foot-5, and if you’ve been reading my blog for a couple years (and have a sick memory), he might look familiar. 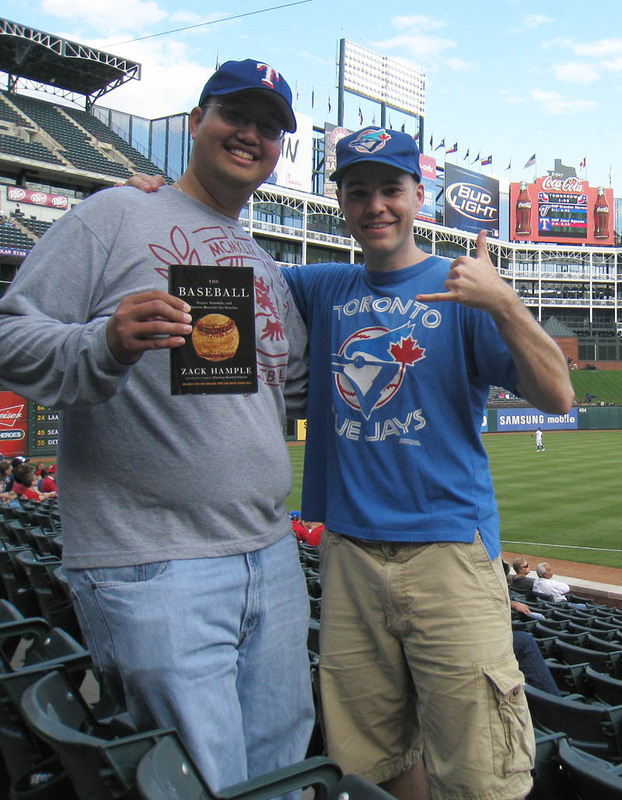 He and I first met on 5/3/09 at Rangers Ballpark when he showed up with a copy of my last book, Watching Baseball Smarter. Unfortunately, I didn’t end up getting that ball. This was the view from my actual seat. To hell with third-out toss-ups. 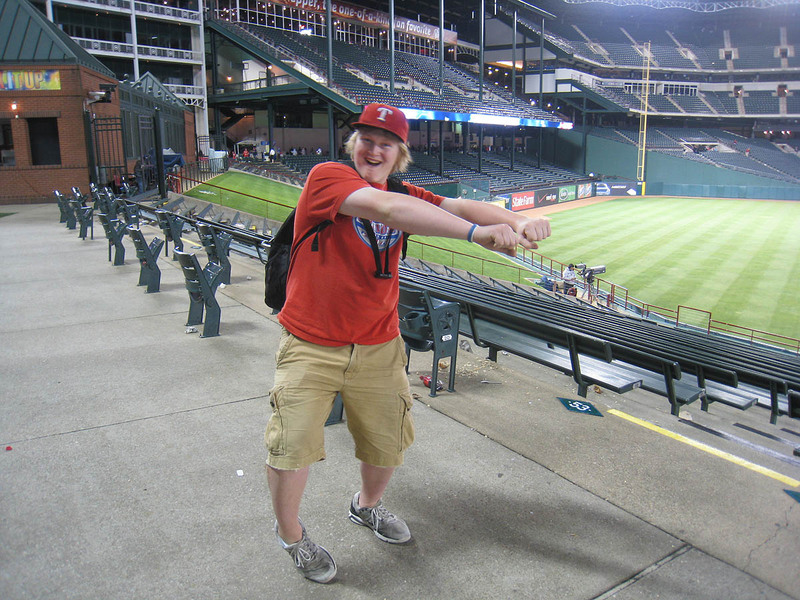 I wanted to run out onto the berm and catch a home run. 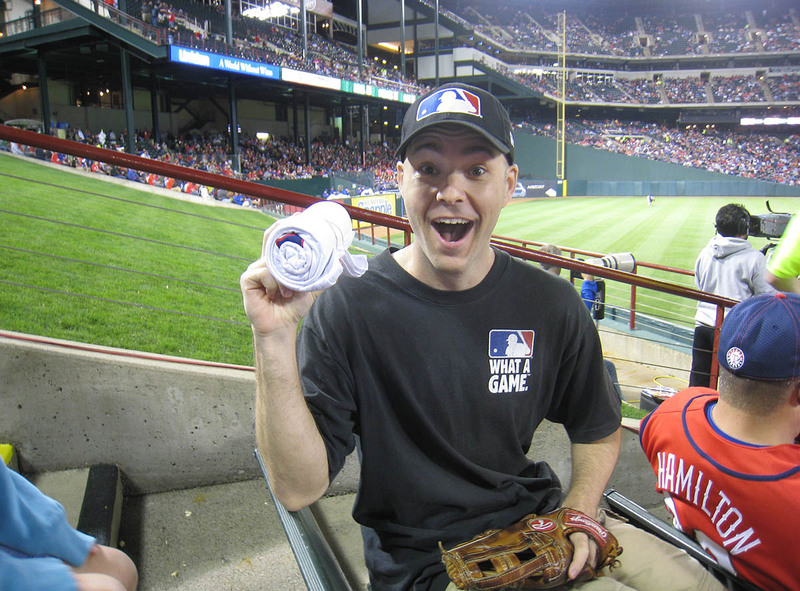 That was actually my goal — the ONE thing I wanted to accomplish — in Arlington. The three of them were great, and we talked on and off (mostly on) throughout the game. “Can I ask you a really random question?” I said to Mark in the sixth inning. 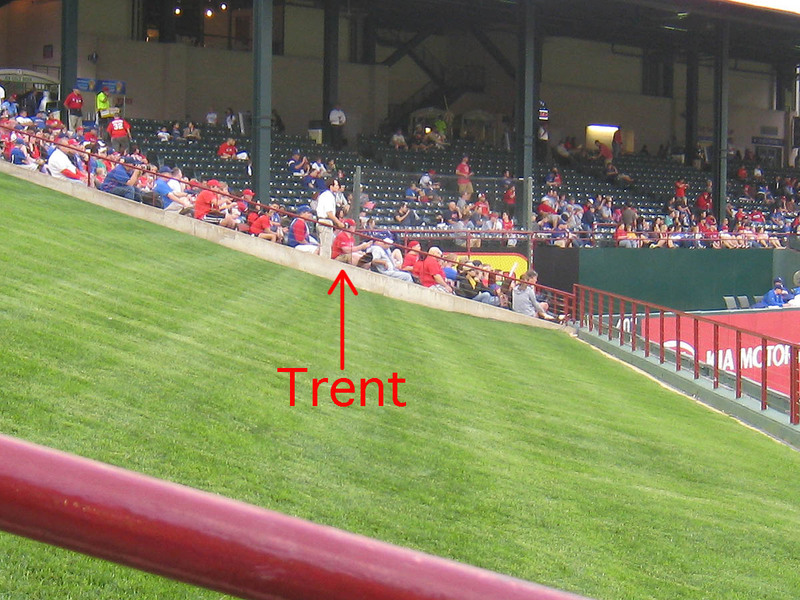 As you can see, Trent had also jumped over the railing (on the right side of the berm). 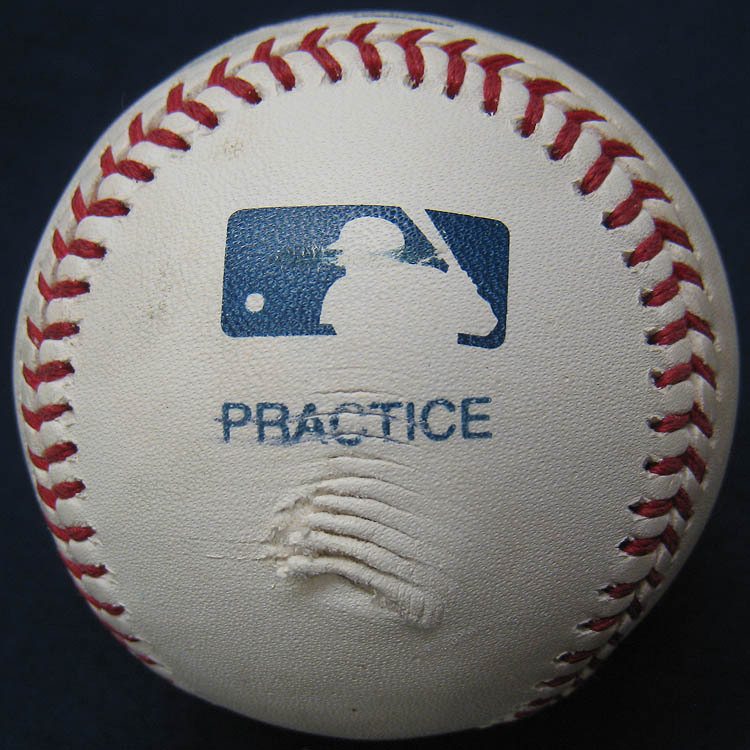 The dollar sign indicates the “money spot” where the ball ended up landing. I wasn’t sure what to make of it. For a moment, I thought he was taunting me, but then I realized (and he confirmed it later) that he did it as a shout-out/tribute to me. He’s a good guy, and he was just having fun with it, and if I couldn’t be the one to catch the ball, I was happy that he got it. But man, I was really kicking myself for not having been in my seat. 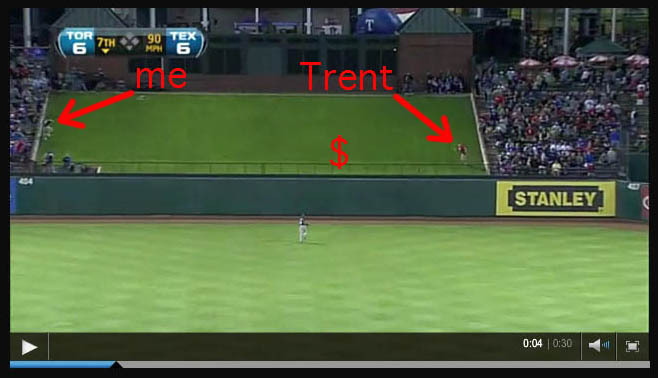 I still think Trent would’ve caught the ball, but I would’ve made it a lot closer. Here’s the video highlight of the home run on MLB.com. Trent wasn’t able to give me a ride, so I went back to my hotel and dropped off my dying backpack. Then I spent an hour updating the stats and taking the ball photos that you’re soon going to see. Then I walked to Walmart. It was midnight. It was cold. I had to walk past cheap motels and car dealerships and fast food chains that I didn’t even know existed. I stopped at Hooters to ask for directions. (No, really.) And when I reached the Wall of Mart, I saw a wall of backpacks that all had Cowboys logos. Thankfully, there were two other sections in the store with backpacks, and I found a logo-free beauty for $17. It was 1am by the time I got back to the hotel. I was dead tired –but happy — and I stayed up for a couple more hours. • 162 balls in 19 games this season = 8.5 balls per game. I thought I saw you streaking in from the left GLOVELESS chasing that homerun. I questioned myself because I didn’t see your glove. Now it all makes sense! Good work! It would also be cool to see photos of your travels (hotel, flight, Wal Mart, etc) as well. Thanks. I tend not to post too many random photos on baseball trips, but if you look back at some of my off-season travels, you’ll see all kinds of images. Hey Hample! I met you at this game on the 3rd base side and Trent after the game in the parking lot. 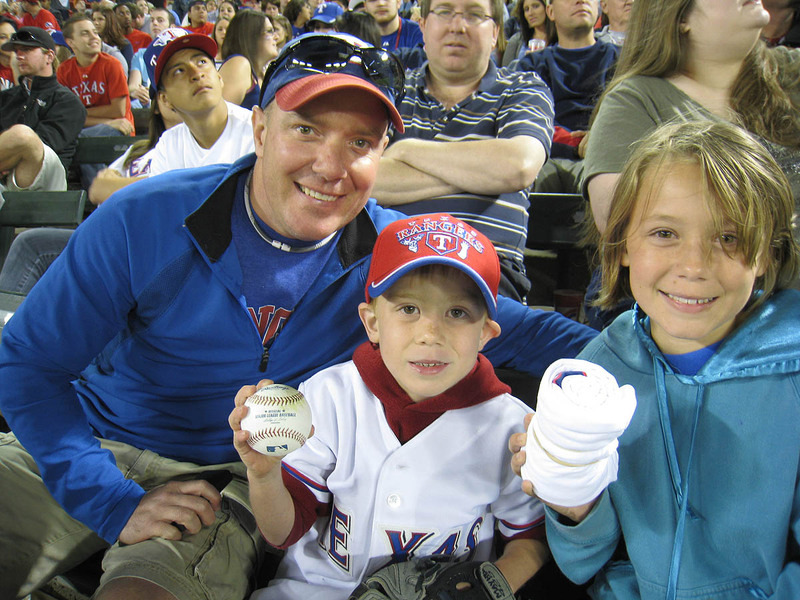 First off, thanks for the gracious words about Arlington Stadium and the Rangers. 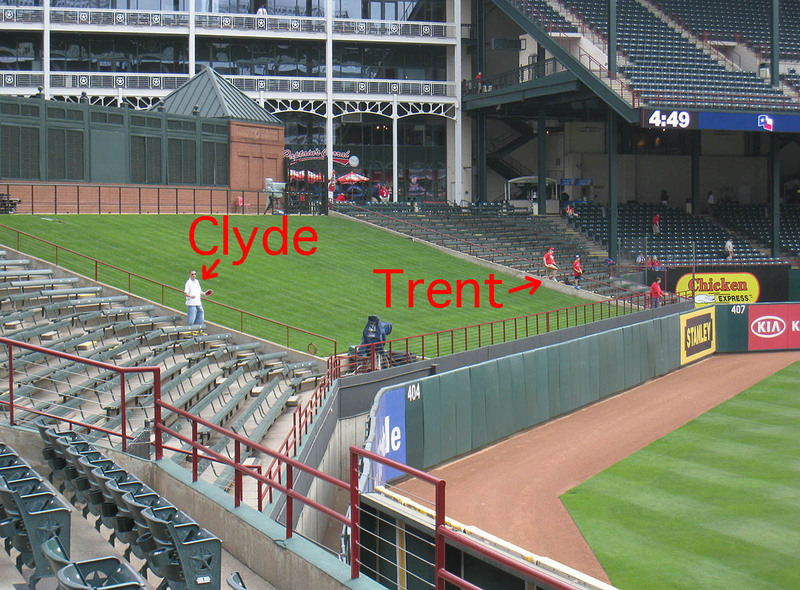 Second, what gate is open early enough to get in while the Rangers are taking BP? How early can you get in? Thanks! Nice to hear from you. I went in the home plate gate. Season ticket holders can get in two and a half hours early, and they can bring a guest in with them. That’s how I was able to get inside at that time. 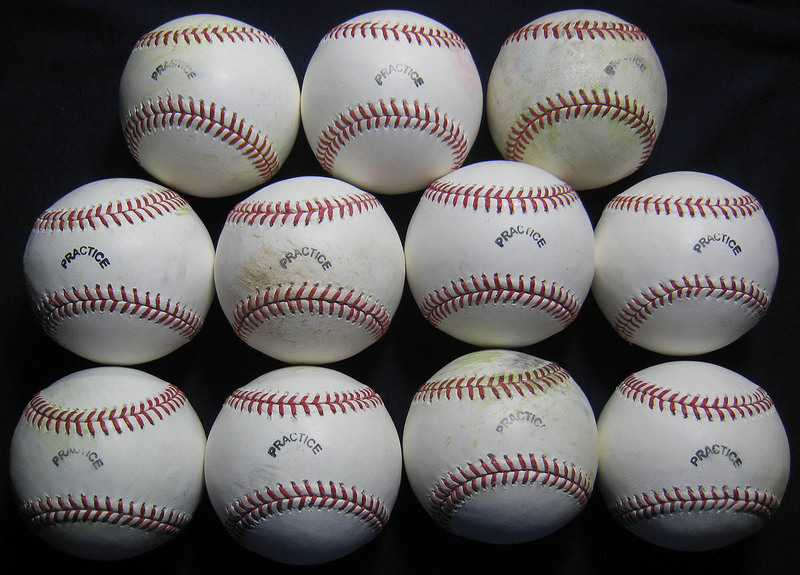 With all the baseballs you tend to bring back from trips, do you have any good stories about airport security checking your bags and seeing all those baseballs? 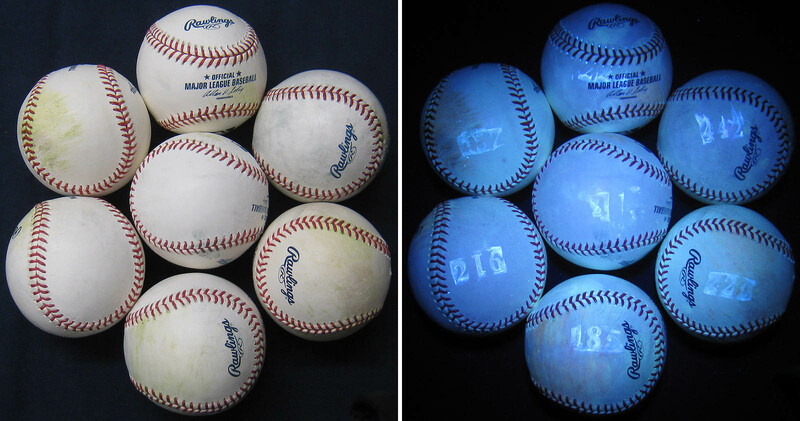 Or do you tend to check your baseball bags? Nothing too crazy. Often, the bag-scanner-dudes ask if I have avocados (they obviously see the cores and don’t know what to make of it). 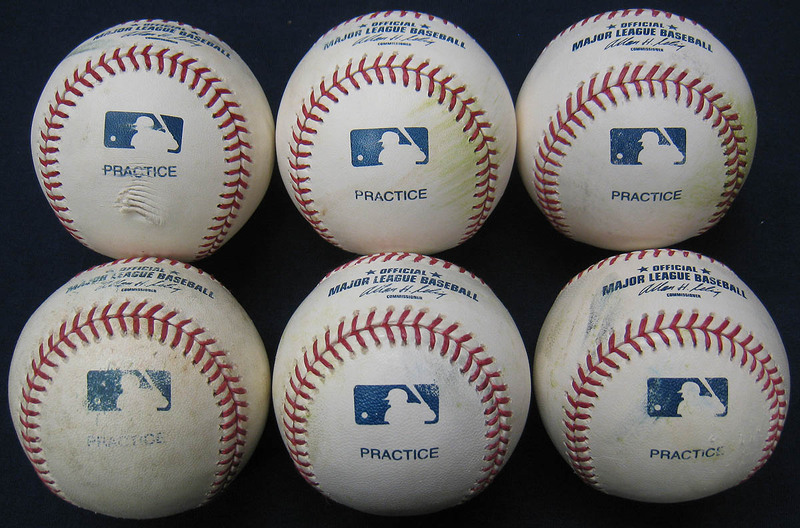 Many years ago, I got asked a couple times to take the baseballs out and show them.